May is one of the busiest months in the garden, especially towards the end of the month when we can start to plant out pots and tender vegetable plants after the danger of frost has passed. This month I will be planting out my beans. I’ve pre-grown them in the greenhouse but it is also possible to put them straight into the ground. Do add plenty of well-rotted manure as they have a lot of growing to do in the coming season and will need the nutrients. I build (with help from Mike) a framework of hazel poles to grow the runner beans and climbing French beans up and then I grow my courgette plants underneath. This seems to work really well – courgettes are one of the few vegetable plants that don’t seem to mind some dappled shade and they love being sheltered. It also saves space if you have raised beds like mine. This year I am growing the French climbing bean ‘Cosse Violette’ which has purple pods and a lovely mauve coloured flower. The beans go green when you cook them but are very sweet and delicious – it’s one of my favourites. The runner beans I’m growing are ‘Scarlet Emperor’, described as the best-flavoured bean available, so I’ll see if I agree. The trick with runner beans is always to pick them young and keep them well watered through any dry spells to avoid them getting stringy. My courgettes are the yellow variety ‘Golden Zucchini’ – they produce plenty of succulent yellow courgettes which look and taste great. I’m a big believer in the vegetable garden looking as good as it tastes. I always grow edible flowers that can be added to salads and stir fries, and they help attract pollinators to my plot as well. 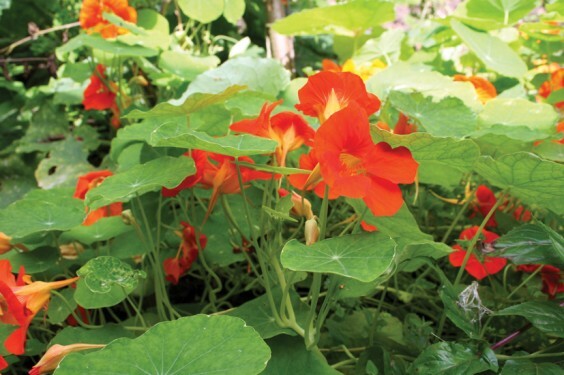 Nasturiums are excellent, along with Calendula and nodding onions. The early potatoes can be lifted next month, once they have flowered and the plants start to die back down. As you will still be earthing them up this month (literally dragging the soil up around the plants) to prevent the tubers getting any light on them and then going green, do remember to feed them – a quick sprinkle of blood, fish and bone on the soil which is then worked in as you earth up is ideal. May is the month to get those summer pots planted up. I’m a fan of red geraniums and try to keep the colour theme simple as I do believe it looks more stylish. Perhaps try two colours per pot and no more. Geraniums do well in full sun and need a regular feed and dead-heading to keep them looking good. If you are limited on space and want to make edible pots, try courgettes, herbs or even strawberries in your containers near the house. Late May and early June is the best time for the cottage garden perennials; they just burst into full flower at this time of year and if you have planted them close together it will cut down on the weeding, too. Any gaps in the border can be topped up with some mulch – the council mulch is excellent and sterilised so it won’t add any weed source to the border and will help with moisture retention. If you haven’t staked the taller perennials, now is the time to do it. I like to keep a natural look so I use trimmed birch twigs. Get a single pole, which again can be hazel (willow will root in the ground), and wrap the twigs around the base of the plants. The plants will then grow through these branches and it will give some stability on windy days to stop them falling over. You may be lucky enough to get early strawberries in May – my neighbour has a variety that comes very early and I keep meaning to get some plants from him, but most of the fruits like blackcurrants and raspberries will be fruiting in June. If you want to save all the fruit for yourself, now is the time to net the bushes and prevent the birds from nicking your crop. Do keep an eye on the fruit as it comes, particularly with raspberries as some varieties can seem to be almost over in a day. Regular picking will help encourage the new berries to come through. If you have a newly-planted fruit garden you may need to water in prolonged dry spells, but on older plantings a yearly supply of mulch around the roots will help keep the moisture in the soil. The final job to do is to enjoy your garden this month – think of all the winter months when we longed for May sunshine and the colour and variety we now have. I will be at the RHS Malvern Spring Show from May 7 to May 9, doing The Journey Garden for St Michael’s Hospice (stand number SG815). I’m there every day so do come and say hello.